Otherwise, there was nothing whatsoever that could have redeemed such a humiliatingly dire performance. 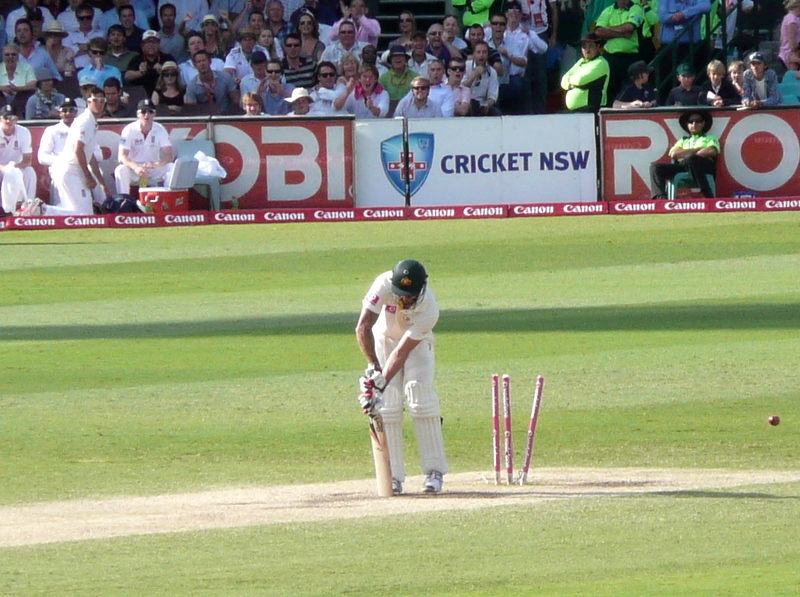 The hosts were all out for 280 in their first innings, could not bowl England out until they had scored the highest total in history of runs in an Ashes Test in Australia, and are now teetering on the brink of an innings and series defeat, with three wickets remaining on a pitch that is still good for batting. That is the unvarnished reality of how this final Test stands and how it will finish tomorrow when Michael Vaughan presents the Waterford crystal trophy to the 2010-11 Ashes winning captain, Andrew Strauss. Touted as a competition between two equal (and fairly ordinary) sides, this series has proved anything but. Australia have been outperformed on all levels, with England winning on most instances in a head to head comparison of the members of each team. Only Michael Hussey can be said to have shown a glimmer of the junkyard dog who would rather chew off its own foot when trapped than wait for the hunter’s bullet, and Peter Siddle has been another unsung warrior whose deeds have gone largely unheralded because he does the basics well rather than promising so much while delivering so infrequently like Mitchell Johnson, and mainly because he is on the losing side. 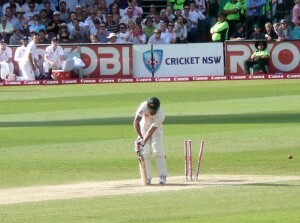 For England, Graeme Swann has not quite torn Australia apart, with an average so far of 41.78 that if foretold in isolation to match results before this series started would have had England fans fearing for the loss of the urn. Instead, it is England’s quicks who have stepped up, in particular James Anderson, who would surely share the new ball for any Test nation you could care to name (Anderson and Steyn, anyone? Nope, I would not rate my chances as a batsman either). Anderson made magic with the ball again today. When Mike Hussey, who lasted for 60 minutes, fell for 12 to Bresnan after having survived an Anderson barrage of hooping, swinging hand grenades, it must have felt like the end to the longest innings of his life. It is tempting to say that if Ricky Ponting has lost Australia the Ashes, then Michael Clarke has lost them the series, but the problems runs deeper than just captaincy for this team. Rebuilding will be a long and hard process. I cannot possibly end this entry by not commenting on perhaps the most poignant moment of the day. Before play started it was announced on the PA that Paul Collingwood will retire from Test cricket after Sydney. Collingwood, a player of self-confessed limited ability who has surpassed his own limitations and given steel, heart and backbone to the England team on many occasions, has almost always done the right thing, with perhaps that 2008 incident of the run-out of Grant Elliott at the Oval the only blot on an otherwise honourable and admirable career. He has admitted he has been struggling for runs in this series, and having failed again in this Test, and with Eoin Morgan waiting in the wings, he has realised it is time, and he has done the right thing. The final match in an historic series in which England retain the Ashes; the final match in which they win the series; he could have picked no better time to make his announcement. I admire Paul Collingwood immensely. I admire him for all that gritty, plug-ugly scrappiness at the crease on the occasions when he pulled England’s bacon out of the fire when they were up against it; I admire him for all the impossible catches he took at backward point, in complete defiance of the laws of gravity; I admire him for the bit of ginger he brought to the team – the smashing orangey bit in England’s Jaffa Cake. While he will continue in other forms of the game, it is hard to imagine an England Test team without Paul Collingwood MBE in it.